Help DunkerPunks.com connect with every youth from NYC! At NYC, hundreds of youth participants stepped forward and made a commitment to be Dunker Punks by living and loving like Jesus. 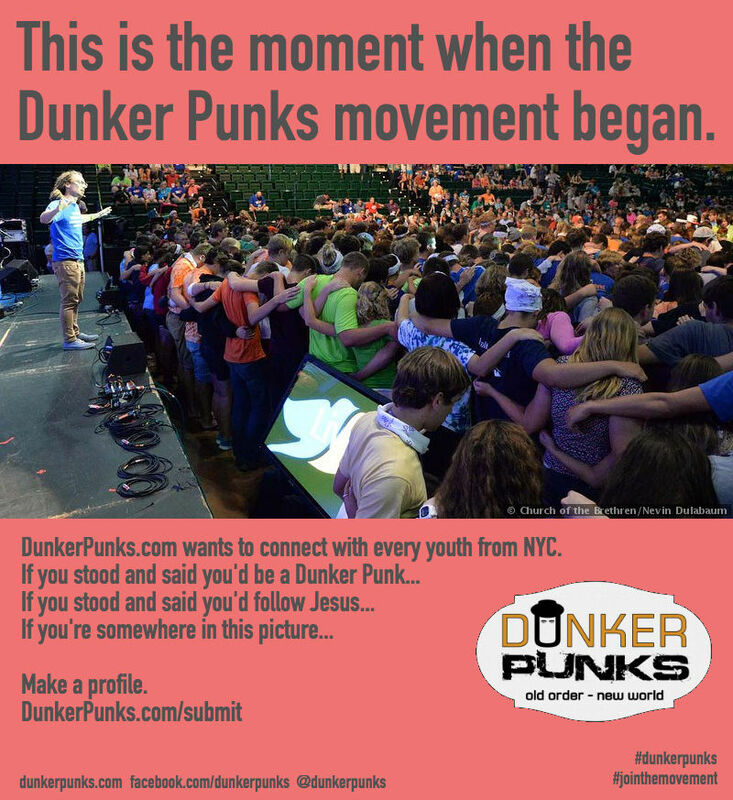 DunkerPunks.com hopes that each of these youth will fill out a simple “Dunker Punk Profile” about simple yet radical ways that that are following Jesus. Click here to make your profile! DunkerPunks.com is a youth owned and operated website supported by On Earth Peace and the Church of the Brethren. The goal of DunkerPunks.com is to connect with youth in the Church of the Brethren, give them a platform to communicate their beliefs, experiences, spiritual needs, and actions, and help them inspire and support one another. What is a Dunker Punk? A Dunker Punk is a young person who is a member of a rebellious countercultural tradition that radically commits their life to living God’s Calvary-shaped love in the power of the Spirit, to the glory of the Father. “Dunker” refers to our spiritual heritage and baptizing tradition, and “Punk” refers to our young, radical, counter-cultural, and rebellious nature. We practice simple spiritual discipline by praying the Lord’s Prayer and studying Jesus’ teachings. We follow Jesus through simple, radical action in our personal lives, in our communities, and on a global scale. Why fill out a profile? Dunker Punks can express how they are following Jesus. They can share their thoughts, beliefs, hopes, and actions. They can learn from each other and lead one another. All it takes is two simple questions: “How are you radically following Jesus?” and “How can other Dunker Punks help?” Remember, radical doesn’t have to mean big. Small steps like loving our enemies or reading the Sermon on the Mount are radical and countercultural. Encourage NYC youth in your family, congregation, and district to make a profile. DunkerPunks.com hopes that every youth from NYC gets to make a profile, and we need your help to make that happen.